I spent more than a decade trying to figure out why some companies ended up being such incredible long-term investments while other businesses didn't, even when they created important technologies or popular new products. I finally figured it out when I stumbled onto a long-lost essay that investing legend Warren Buffett wrote back in 1983. It basically gave away the whole secret... but he described it in such arcane accounting language that few people understood what he was saying. In today's essay, I'd like to tell you about my personal search for the perfect investment. I'll tell you the secret behind super-high-quality stocks that get better and better over time. And finally, I'll tell you which two companies fit that description today. I originally called my financial research company "Pirate Investor." No, that's not because I was writing about some kind of semi-legal investment strategy based on stealing or marauding. It's because when I started my own financial journal, I was fascinated by the radical changes new technologies were making in a wide range of major industries. I'd grown up with computers. I'd gone to computer-programming summer camps. Back in the early 1990s, I had watched my friend Reed Arnos build one of the first IP telephony systems anywhere in the world. I knew, long before most people had ever used e-mail, how the Internet was going to radically change our lives. My core idea as an investor was to buy small, aggressive companies that were using new, disruptive technology to "pirate" market share from massive companies that were too big to handle the radical changes taking place. A simple example: I knew advances in semiconductor technology would soon allow chipmakers to produce digital cameras that were superior to any chemical-film cameras and at far, far lower prices. It was a sure bet that Kodak would go bankrupt. And companies involved in the hardware and software of digital photography (like Adobe Systems and National Semiconductor) were sure to grow fast. Selling short Kodak in 1998 and buying digital-film businesses was one of the surest ways to make a lot of money in the stock market. Many of these small, fast-growing companies soared – like Cree (white LEDs), JDS Uniphase (optical communication equipment), and Qualcomm (wireless chips). But then, in 2001 and 2002, I learned that investing in new technology isn't always easy. Not every innovation works. And not every expensive stock grows into its valuation. Mistakes in this kind of investing are usually catastrophic. I made my fair share of big mistakes. Eventually, those mistakes soured me on only investing in new technology. I got tired of making "all or nothing" bets every time I made an investment. I wanted to find stocks that could serve as a stabilizing force for my portfolio. Along with Dan Ferris, I began researching deep value stocks. We launched Extreme Value, which featured only value stocks. These were stocks that were trading at big discounts from their peers. Blair, for example, was the first stock we recommended in Extreme Value. At the time, the direct-mail clothing retailer was just about the cheapest profitable company in the entire stock market. The shares were valued at less than 75% of the company's book value and traded for only about six times its annual cash flows. This approach was lucrative, and much safer than buying tech stocks. 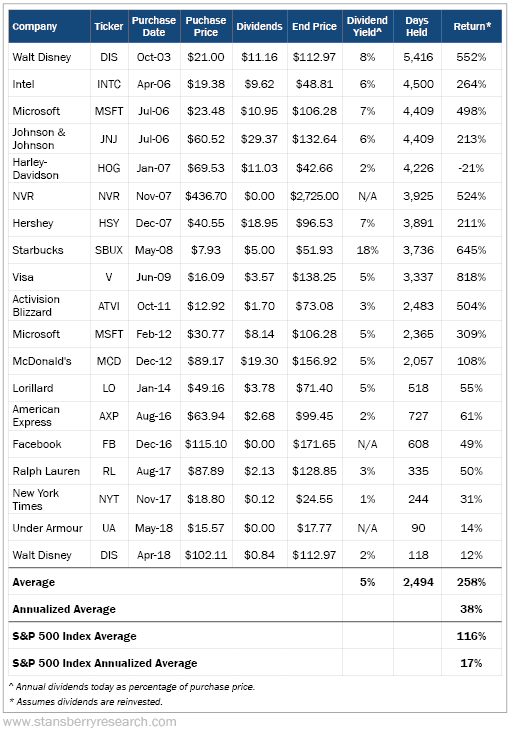 From 2002 to 2006 (the period when I was most involved in deep value investing), we recommended 52 deep value stocks in either my newsletter or in Extreme Value. Almost 90% of these recommendations went up, and the average return was greater than 50%, with an average holding period of a little more than a year. Why? First and foremost, deep value investing requires you to spend a lot of time studying marginal businesses. A stock that's trading at four times earnings isn't likely to be a great business. And as an outside, passive investor in common stocks, you're not going to be able to fix these companies – not unless you want to invest hundreds of millions of dollars and become an activist. As a result, deep value investing requires spending a lot of time with crappy businesses. And that was painful for me emotionally. I didn't want to own a bunch of crappy businesses. I got totally fed up watching third-rate management teams bungle along. Deep value investing also suffered from what I call the "Habitrail problem." Habitrails are plastic enclosures that children use for pet hamsters. (When I was little, my brother and I had a hamster that lived for four years!) Habitrails contain tunnels and wheels that just spin and don't lead anywhere. When you're a deep value investor, all you're doing is hoping that something happens that leads your shares to a higher valuation. That's usually a buy-out. But sometimes the market just reprices the stock, sending shares higher. When that happens, you sell. And then, just like a hamster on a wheel, you're right back where you started, looking for another crappy, cheap business to buy. You're always in need of another deal. And sooner or later, of course, you're going to make a mistake. It was easy and lucrative to be a deep value investor in 2002, 2003, and 2004. An epic bear market had lowered valuations across the board between 2000 and 2002. We had plenty of good opportunities. But as the bull market continued into 2005 and 2006, these opportunities evaporated. It became impossible to restock our portfolio. I found that deep value investing was only a good strategy to follow during certain periods in the market. It didn't work all the time for me. Ultimately, I moved on from looking for deep value. I grew to loathe low-quality businesses and managers. I got tired of "running in place" – holding investments that never really got any better and that I had to sell and then replace to keep making money. And finally, I discovered that during big bull markets, the opportunity to buy deep value almost disappears. I wanted to find a business that would get better and better over time. I started studying companies that could grow their earnings consistently for decades. And I began studying Warren Buffett's entire track record. How did he figure out which stocks would be safe and lucrative over the very long term? What I discovered, I called "capital efficiency." It's a unique trait that allows some companies to grow their sales and earnings for long periods without large, corresponding increases to capital spending. Buffett wrote an essay in 1983 that spelled out the basics of how to find these businesses and why they are such great long-term investments. You can find it at the end of his 1983 letter. Buffett gave this essay a pretty snappy title: "Goodwill and Its Amortization: The Rules and the Realities." First, you want a high-quality business. You quantify that by looking for a high return on net tangible assets (and total assets). Second, you want to find a business that grows without big increases to capital spending or acquisitions. And finally, you want to own a company you're certain will still be in business for decades. Buffett explained where to find businesses like these: branded consumer-products companies and property-and-casualty (P&C) insurance. Once you find them, then you just make sure you don't pay too much for them. Not including the P&C insurance stocks, my portfolio of world-class, capital-efficient businesses is below. The analysis of these stocks is based on a simple buy-and-hold strategy that reinvests all dividends. In short, this is what happens if you buy capital-efficient, super-high-quality businesses when they're trading at a reasonable price – and you do nothing else. To be clear, I'm not saying this is my newsletter's track record with these stocks. The table shows what would have happened if you bought on our recommendation and held through today. But of course, we sold most of the older positions a long time ago. I've been working professionally as an investment analyst since 1996. Virtually every day of the past 25 years or so, I've been looking for great investments or learning how to make them. I sure wish someone would have taught me this shortcut a long, long time ago. To be a great investor, all you have to know is how to identify these kinds of investments. One or two of them (at least) are almost always available in the markets. When we recommended American Express (AXP) in the summer of 2016, we were seven years into a massive bull market that saw average blue-chip valuations of more than 20 times earnings. And yet, we were able to buy American Express at its lowest price (based on its earnings multiple) in more than 30 years. There's almost always a great business for sale. Buy it. As they grow, the returns for their investors improve. It's almost a violation of the Second Law of Thermodynamics: These companies get better and better with time because they scale with very little additional capital requirements. In general, the longer you hold these companies, the better. Yes, you can use trailing stop losses to try and trade around the big problems that these stocks will run into every now and then. We recommended selling Disney (DIS) just before the financial crisis, for example, when we had a profit in the stock. It then fell more than 50%. Most people wouldn't want to sit through that kind of volatility. But... if you can be patient... these companies, because they will constantly and relentlessly increase their dividends, are the kinds of firms you should consider never selling. Buffett didn't invest in Coca-Cola (KO) until he was 58 years old. In 1987 and 1988, he invested more than $1 billion into the stock, which was 35% of Berkshire Hathaway's entire equity portfolio. Ten years later, he'd made almost five times his money, about $7 billion in profit. Most investors have a hard time believing that investment outcomes like this are possible for them... But they are. Just look at the results we've achieved so far with our best, capital-efficient ideas. If you could only follow one investment strategy and had to invest all your liquid assets in those ideas – no hedging – what would you own? For me, there's no question. I spent my life looking for the perfect investment. And I've found it with my super-high-quality, capital-efficient approach. Today, two companies in my recommended portfolio fit this model and trade at reasonable prices: entertainment giant Disney (DIS) and chocolatier Hershey (HSY). Editor's note: Porter covers the specifics of how to invest in world-class companies in his monthly newsletter, Stansberry's Investment Advisory. For a limited time, he's offering access at a huge discount... Plus, you'll receive a copy of his latest book, where he reveals a massive political force brewing in the markets – and how to survive it. Click here for more details. "Your capital is precious," Austin Root writes. "It demands higher standards." Learn more about how to spot – and commit to – the world's best businesses right here: It's Time to Stop Renting Your Stocks and Start Owning Them. Recently, Austin walked DailyWealth readers through a perfect example of how capital-efficient businesses set themselves apart... and how they reward shareholders in the process. Check out his essay right here. Waste Management (WM) is the biggest name in garbage collection. 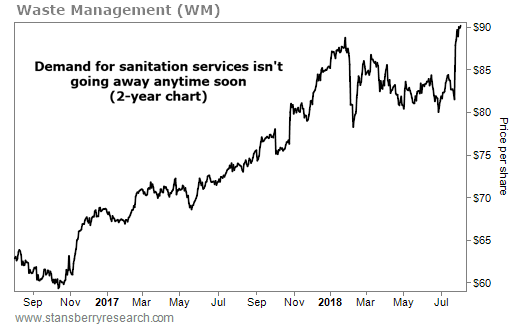 The $38 billion trash and recycling giant isn’t the hottest stock on Wall Street… But no matter what happens in the economy, folks still need to take out the trash. The average American produces more than four pounds of waste per day. It’s no wonder that in the most recent quarter, Waste Management’s net income rose 38% year over year… to nearly half a billion dollars.